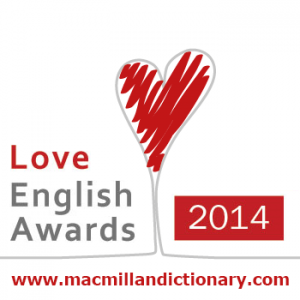 Over on Macmillan Dictionary we have announced the winners of the Love English Awards 2014! Back in first place, after winning the award for Best Website two years ago, is Hungarian website 5 Perc Angol (5-Minute English)! They narrowly missed out on winning Best Facebook page, by coming second after Mastering Grammar, who won the prize in this new category. The supporters of teacher Luke from Luke’s English Podcast united as his blog got voted Best Blog for the fourth year in a row! Hearing of his win, he even wrote a poem about it. The runners-up in this year’s Love English Awards also deserve a mention, with the British Council’s Learn English website and Facebook page coming third in the categories Best Website and Best Facebook page. Seonaid’s website Perfect English Grammar came second in the category Best Website. Numbers two and three in the category Best Blog were Spanish blog El blog de Amanda and English with a Twist by Shanthi. Well done to all the winners and thank you for voting! Support your favourite English language hub!